NEMO Losi 4P Tent. The Losi's award-winning design has a unique pole configuration that creates maximum interior livable space for the weight. NEMO's design process — designing from the inside out — results in tents like the Losi with more headspace than competitors. 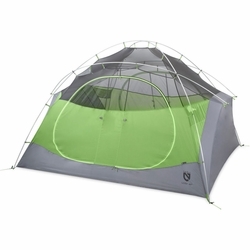 This truly versatile tent offers the ideal combination of livability, durability, and packability, making it a go-to for all types of camping and adventure. The convenient roll-up stuff sack is a nice added feature, keeping your tent, stakes and cords supremely organized. If you’re looking for a one-tent quiver, Losi’s the tent you’re looking for. Award-winning design with maximum interior livable space for the weight. More headspace on the interior than comparable tents. Double entry and two vestibules provides convenience, access from both sides, and gear storage on both sides of the tent. Light Pockets™ turn your headlamp into a tent lantern with special light-diffusing fabric that casts an even glow throughout your tent's interior. Convenient roll-up stuff sack keeps tent, stakes and cords organized. No-See-Um-Mesh canopy provides breathability and view of the stars when used without the fly.